Photo of the star forming region NGC 6334I, also known as the Cat’s Paw Nebula, taken by the NASA/ESA Hubble Space Telescope (top) and the high frequency radio spectra (bottom). The blue line shows the spectral lines detected by ALMA and the gray line shows the lines detected by the European Space Agency’s Herschel Space Observatory. The ALMA observations detected more than ten times as many spectral lines. Note that the Herschel data have been inverted for comparison. Two molecular lines are labeled for reference. Credit: S. Lipinski/NASA & ESA, NAOJ, NRAO/AUI/NSF, B. McGuire et al. Similar to how different radio stations on Earth broadcast different information, the various frequencies of radio waves coming from space carry different information about the environment and chemical composition at their source. ALMA’s Band 10 (787 to 950 GHz) receivers are its highest frequency band yet. It has been a difficult frequency band to observe, not just for ALMA, but for other ground-based radio telescopes as well. Brett McGuire, a chemist at the National Radio Astronomy Observatory in Charlottesville, Virginia, and his team observed NGC 6634I, a nursery cloud of massive stars, using the Japanese Band 10 receivers. NGC 6334I is part of the Cat’s Paw Nebula located 4,300 light-years away from Earth. NGC 6334I has been previously observed at this frequency by the European Space Agency’s Herschel Space Observatory. But whereas Herschel detected 65 molecular emission lines, ALMA detected 695. The molecules detected in the direction of NGC 6334I include methanol, ethanol, methylamine, and glycolaldehyde, the simplest sugar-related molecule. 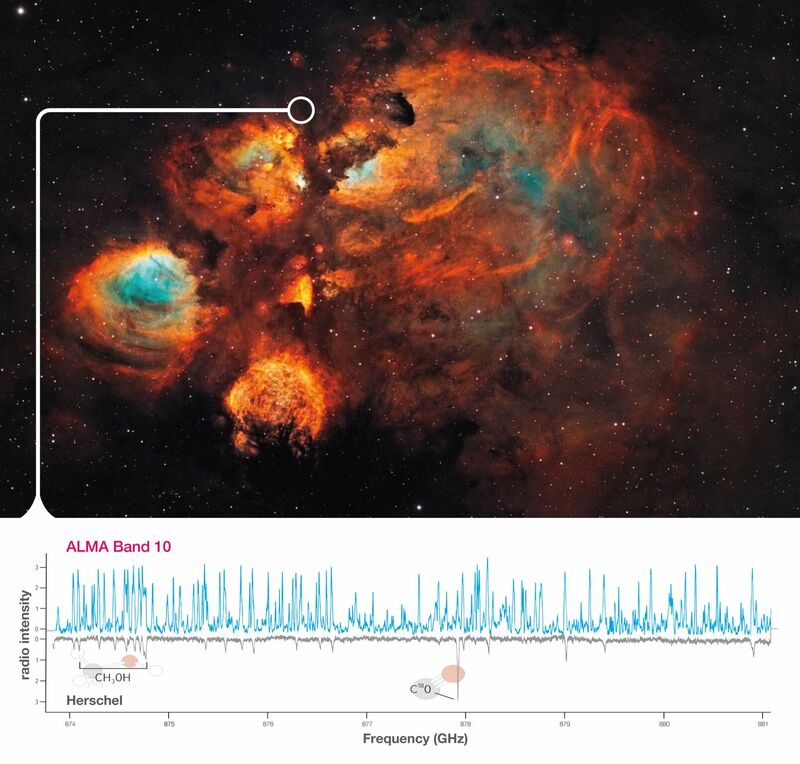 Glycolaldehyde has previously been discovered at other places in space, but the clarity of the ALMA detection raises expectations that observations using the Band 10 receivers will provide new insight into the distribution of these and other molecules.